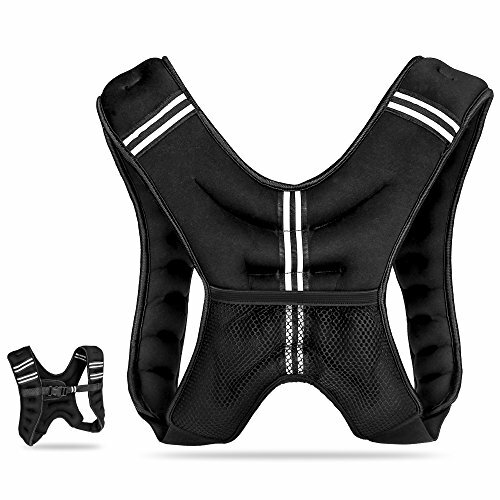 This weight vest with adjustable buckle straps in front of chest comes with one size which is suitable for both adult and youth for strength training. The weighted vest for weight loss adopts excellent neoprene fabric with quality sand filled in, which makes men and women feel soft and comfortable. Mesh pocket on the back of the weight vest is good to store some belongings when runing or walking outside. There are multi reflective tapes on both sides of the weight vest for running as well, which makes the night running much safer. One Size for Most This weight vest for workout comes with one size which is suitable for both adult and youth, men and women. An adjustable buckle strap in front of the chest to fix the weighted vest and make the weight vest more fit body. Soft Neoprene for Comfort The weighted vest for fitness adopts excellent neoprene fabric with quality sand filling, which is super soft and helps to concentrate the weight in the chest and upper body during training and builds core muscle strength. It is better to hand wash the weighted vest instead of machine wash.
Great for Strength Training The weighted vest weighs 12lbs / 5kg, which is perfect for strength training, workout, crossfit, fitness, walking, running. Men and women even wear the weight vest for stairs climbing. The weighted vest helps improve cardio conditioning and body strength, giving you more power, speed, and agility. If you have any questions about this product by JBM international, contact us by completing and submitting the form below. If you are looking for a specif part number, please include it with your message.